Operating expenses are the costs that are required to keep the business going day to day (as opposed to expenses that are directly related to manufacturing a product or delivering a service – those are a different type of expense). Operating expenses are listed on the income statement and, along with other costs, are subtracted from revenue to determine profit. Operating expenses can also be referred to as SG&A (sales, general and administrative expenses) and are often thought of and referred to as “overhead.” The category includes items such as rent, utilities, telephone, research, and marketing. It also includes management and staff salaries… plus everything else that the accountants have decided does not belong in COGS. 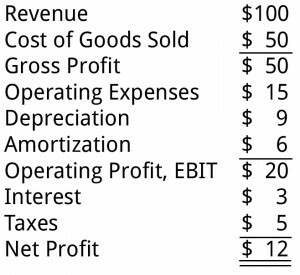 In this sample income statement, you can see how operating expenses are deducted from revenues and affect profit. Amounts shown in thousands. 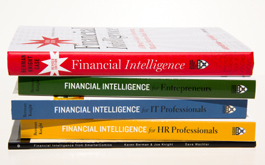 You can think of operating expenses as the cholesterol in a business. Good cholesterol makes you healthy, while bad cholesterol clogs your arteries. Good operating expenses make your business strong, and bad operating expenses drag down your bottom line and prevent you from taking advantage of business opportunities. Another name for bad operating expenses is “unnecessary bureaucracy.” Also “lard.” You can probably come up with others.